We are product of big bang. I mean all matter, including us comes from somewhere. There are secrets buried out there in the past but I am sure about us being celestial objects and stardust and all. I am unique, meteorite rare material that is priceless. I know nothing normal constitutes my being. What do , the we know, we don’t trust without a proof. We want it all written down and explained to us. What happened to feeling things? Huh, what about the vastness of the sky, what about having no choice and what about those infinite impossible events you can’t just explain the reason behind. Yeah, the so called mysteries. We came from a big explosion or whatever it was, it is obviously big given our minuscule sizes. Instead of cowering from the universe and shying away I suppose the better way out is to embrace it, feel yourself at ease. Start with the very ground you set foot upon, design your room to your interest, then our home. Reach out, transform the society. Change the environment and the world. Feel you are a part of this wonderful creation and your role will be assigned to you soon enough. This universe needed you for something and that is why you were created. A beautiful gift has been bestowed upon us and as humans I have to sadly admit that we are squandering these gifts away. We need to seek out and connect to our baser instincts be better human beings. When we die we should take leave from a better society than we came in. Truth is something we encounter daily in our lives. Truth which is simple and plain and supposedly realistic. Truth which sometimes is stranger than fiction. Truth which has ben associated with words like faith, fidelity, loyalty, veracity and sincerity. Indian scriptures have long preached us the concept of truth by phrases like ‘Satyameva Jayate’ meaning truth alone triumphs and ‘Satyam Muktaye’ meaning truth liberates. Thus showing us what truth is capable of. Truth is difficult, almost unbelievable at first and sometimes even shocking. Truth is considered perennial, universal and unchangeable across time, space and frame of referance. Truth is absolute and universally acceptable. Truth is superior even to silence. Most of the times we believe something as the truth but it ain’t and sometimes we are just oblivious to the truth when it stands right in front of us. Some among us choose to ignore the truth and some are simply too busy to pursue it. Some surprisingly believe that search for truth is frivolous and an activity in futile. Such human beings are the most disappointed in life. Truth alone triumphs, yes that is true indeed and truth always triumphs but to understand truth is always so obscure and hidden that we always miss it. I have yet to discuss about falsehood, the opposite of truth. Lies which are as prevalent in our lives as the truth and for some more than the truth. Truth is simply the reverse of a lie. By default everyone is supposed to be truthfula, because from truth emanates honesty and integrity. A lying person will be corrupt and immoral to say the least. In the modern time we live in it is of utmost importance that we inculcate truthfulness in our lives because until and unless we are truthful we can never be honest and moral. We must aim to impart these traits in our youngsters. As of now when we look around we see dishonestly, falsehood, corruption and immorality in our vicinity everywhere but iff we start with ourselves we can change those around us. Let us begin the change and make this world a better place. Truth is your realisation which is based on physical and sensual experiences. When we see a truth being verified universally can be termed a fact. If you are ever in search of truth just let everything change its forms. That which remains in the end is the truth because truth needs no saviour. I vow to be truthful always and speak the truth everytime. I vow to search for truth and I vow to fight for it always. Do you ? After I died I became a thought, a consciousness, a way of thinking perhaps. The body around my mind had been detached like the falling of a leaf from a tree or a raindrop leaving its cloud. After I died I lived more than I had ever when I was alive. Being alive and dead is not so different it seems now. I am alive but as a pure expression, and no strings that came with the body are now attached. I have lived before by many names and by many faces. In the transition called death, I realise that I am actually immortal. I conjoined in the dance I had been dancing since time eternal and the beginning of the universe. Only after I died I realised that I was not less alive but more connected to the portal through which all living pass, have passed, shall pass and will keep passing. This portal connects me to anyone I want. My consciousness is free to plug anywhere I want it to. To who ever I want it to. I can be anywhere, anyone, anybody because I am no one. Since I am zero I can get behind any number. My mind now reckons that it was in a dormant state and now it has unlocked its full potential. I am omnipresent. In one moment I am the wind, in another I am the fruit on a tree , in another instant I materialise as sunlight from the sun , ever changing my form and flowing as one energy to another in the universe. I am not dead, I am more alive now. I am a vibration and this universe is vibrational. At the back of my mind, subconsciously one question has always puzzled me, although there are many such puzzling questions firing in my neurons all the time but the one I am talking about is the trickiest one. I have a simple theory, according to my observations, everything that happens around us has a reason. From the most miniscule to the mega events, everything is governed by reason. What is the reason for universe ? Why was it ever created, and for what purpose ? I have this feeling that no one can understand the question I am seeking the answer of. It is a helplessness to live with a question weighing you down. You may say time comes with answers to all questions, but this question demands a lifetime and no guarantee of a certain answer. To experience what I am talking about is beyond daily and usual. It is bigger and deeper than we can begin to imagine and compared to it I am nothing. Imagine such a grand scheme laid out perfectly, a master plan played out to what end and why in the first place ? We try with our limited tools and intelligence to figure out what it is all about but we to say the least we haven’t even scratched the surface. Time and space are just theories and in reality even what I write is just my perception. The willingness to believe is simply your own decision. The best way to sum up all this is that everything is about choices, at least everything that is about us. The other choices were just made by themselves as the events unfolded. There is no control of human beings over matters of planets or stars dying and comets passing. We can only hope to control nations and planets at most. The universe, however is a bigger concept. If we consider the pattern, the universe is ruled by laws which we cannot understand yet and beings whom we have no proof of! As a poet and as a writer , my theory is the universe has no reason, nothing ever is reasonable. It is all just theories and chains to bind your mind. If anything universe is , it is free. It is beyond all logic, any definition or perception and in the least universal. Author Mayank MishraPosted on April 12, 2016 April 15, 2016 Categories allegorical, futuristic, god, Metaphysical, Metaphysics, Philosophy, religion, science fiction, self, time travel, Travel, Uncategorized, universeTags featured, galaxies, human, life, light, space, theory, time, universe7 Comments on The Reason Behind Universe. This picture has been originally clicked on an iPhone 5s without any filter. 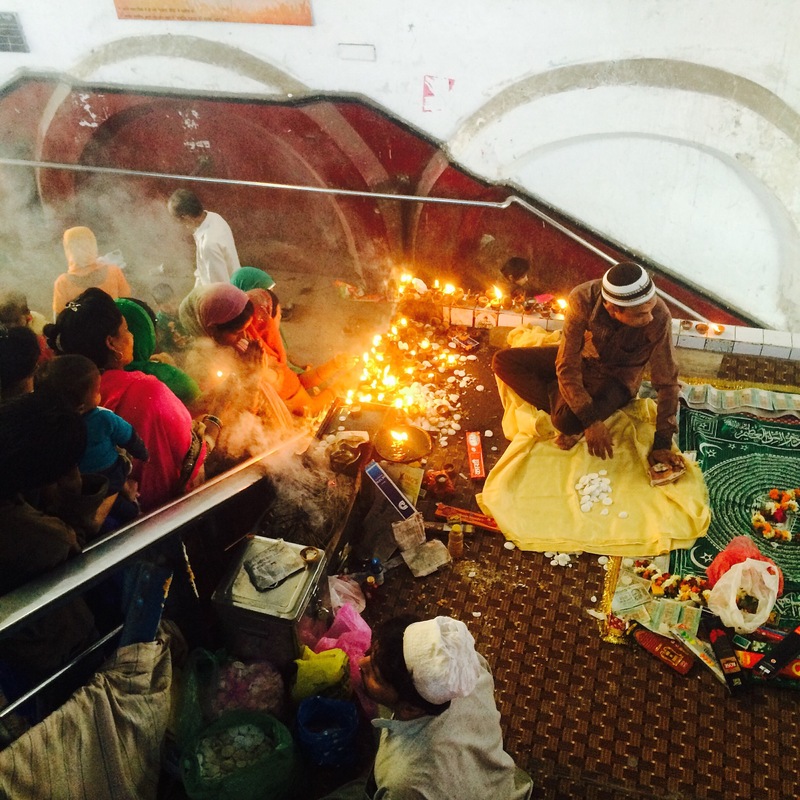 The scene is of a shrine which is located in between two platforms on Ghaziabad Railway Station near New Delhi in India. Inputs and suggestions about the photograph will be appreciated.